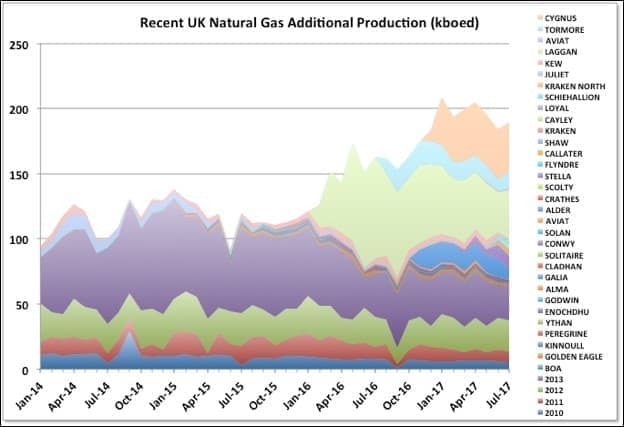 Short-term trends for UK oil and gas production and, to a lesser extent, Norway can be rendered a bit meaningless by seasonal impacts from summer maintenance turn-arounds and cyclic gas demand. Overall, though, both are at or approaching the tail end of the production curve, but with slight upticks in the nearer term. Barring several large and unlikely new discoveries over the coming years the industry will continue winding down in both countries, with the UK ahead of Norway, and exploration and development leading operations and finally decommissioning. 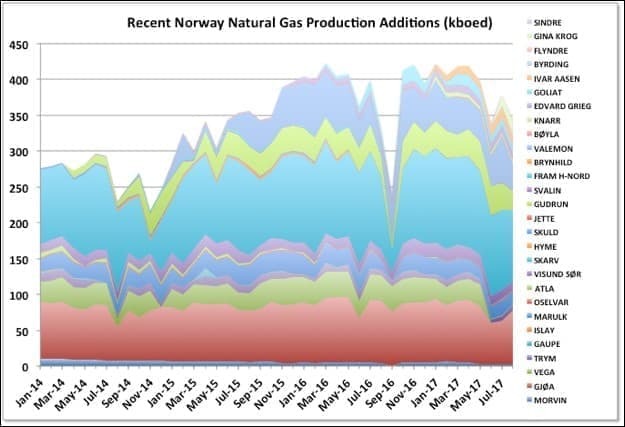 However, some Norwegian gas production still has a multi-decade plateau to come and there are a couple of large oil projects due on-line in each country which will run for twenty to thirty years. The success rate including the ‘hydrocarbon show’ discoveries has been around one in two to one in three, but for commercial discoveries it is more like one in ten to one in twelve (and likely to be lower in recent years once all discoveries have been evaluated). For 2017 there have been two small oil discoveries, drilled as outreach wells from platform drilling rigs, there was one small gas discovery in the Barents Sea and the others are likely to be found non-commercial (including a couple of high profile wells in the Barents Sea). Norway NPD reports monthly production after about seven weeks, and I don’t think it gets revised, or very rarely. 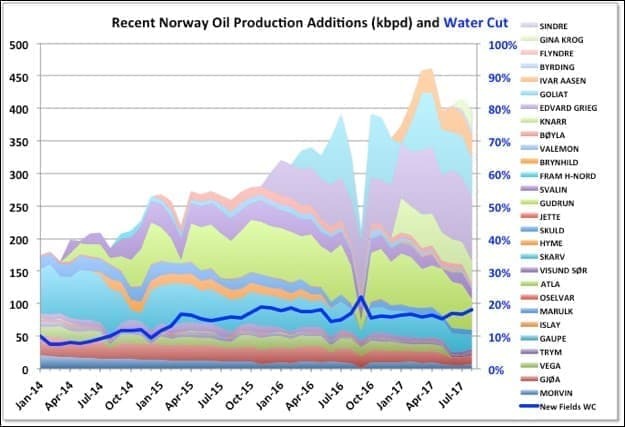 Norway oil production is on a short plateau with a secondary peak (after the main one in 2001) but likely to start a slight decline now. The old giant fields from the 70s and 80s are holding pretty steady, but surprisingly the biggest decline is coming from the newest fields, most of which are small. A lot of those fields were brought on line with fairly short development times from the high price years in 2011 to 2014. One of the new platforms, Goliat with 100 kbpd nameplate, is shut down at the time of writing because of safety concerns around its electrical system, but its numbers show in the August figures reported here. It is unknown when it will restart. It has also been discussed as something of a white elephant in the Norwegian parliament, because of its low reliability since start-up. 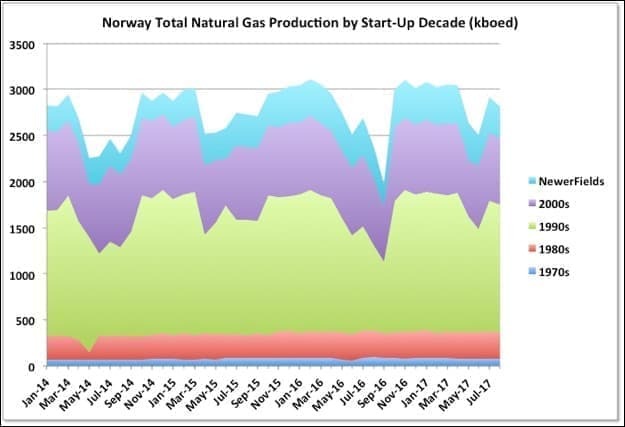 Gas in Norway has been developed about ten years behind the oil. It is currently around its peak level and likely to decline now, year-on-year – January 2016 might have been the peak month, but production is highly seasonal so that doesn’t mean much. 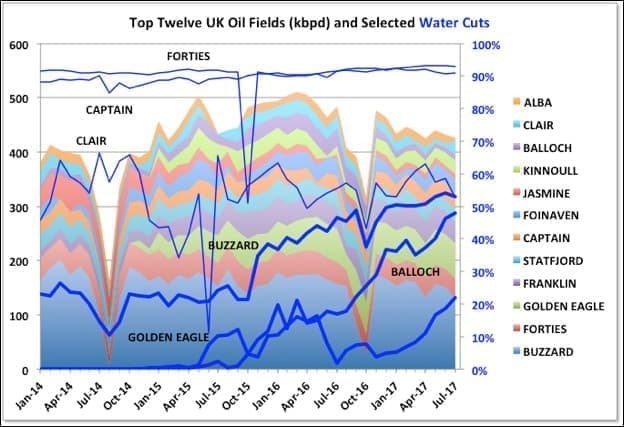 As for oil there have been a few fields added over recent years and they look to be declining fairly quickly. 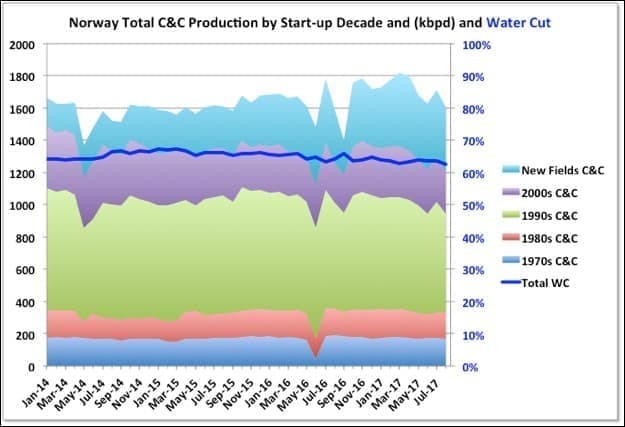 The big producer is Troll which is on a multiyear plateau, though I think the Norwegian government has recently agreed to increase its production level, probably to compensate for other declines. Snøhvit is another big gas producer and is an LNG plant, which would have been designed for a long, steady plateau. The table below shows recent start-ups and fields under active development or close to FID (termed “in clarification” by NPD). Fields that are, or have been, produced are shown in uppercase. Norwegian NPD tends to include smaller discoveries in with their main development field so there are actually more individual fields than it appears (compare with the UK, below, which keeps all the field names individually). There are other discoveries: 35 classified as “production likely but unclarified”; and 36 “production not evaluated”, most of which are likely to end up as “production unlikely” based on recent history (e.g. all the dry wells drilled in the Barents Sea this year, such as Korpfjell which Statoil declared as an uncommercial gas show, are included in this category). This year’s starts-ups have been Sindre, a small field produced immediately after discovery through an extended reach well from Gullfaks C, and Gine Krog, which is a fairly large ($3.7 billion investment), standalone oil development. 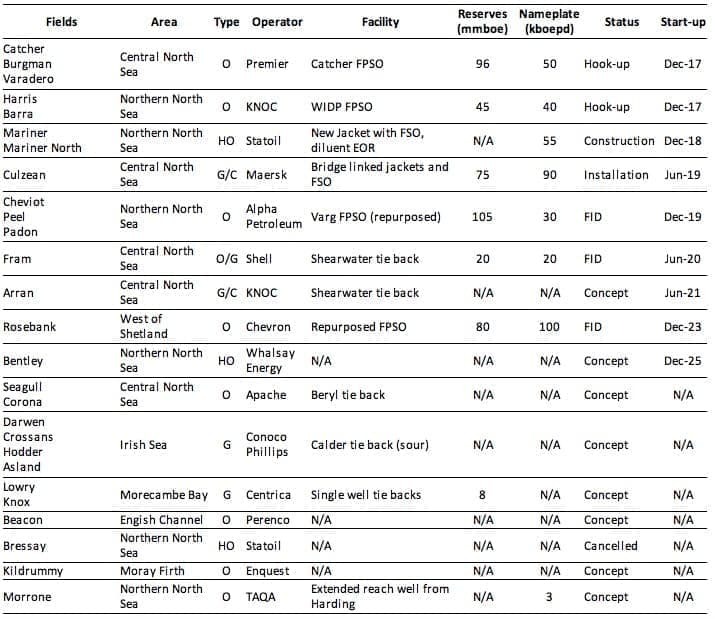 The reserves data in the table below are taken from NPD and some of it wouldn’t count as a strict P50 number by SPE rules; the nameplate capacity is a bit more approximate, not least because it’s not always stated whether oil alone or total equivalent fluids is being considered; it has been taken from NPD or trade media descriptions (sorry for the bastardised units throughout this post). There are a few larger developments due through 2020, but it is likely oil production will decline until the Johan Sverdrup start-up gets into swing. Gas production may peak this year, it’s a bit difficult to tell month-to-month because of the seasonality of the demand. 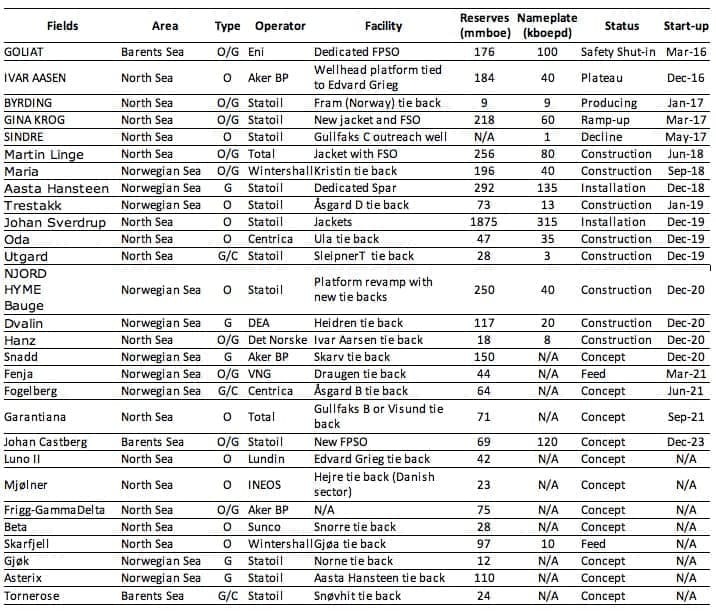 Note that there is a second phase development for Johan Sverdrup, which is likely to go ahead soon and would markedly increase the nameplate capacity (maybe to 500 kbpd), but would not be on-line until around 2022 or so. At the moment the final big development will be Johan Castberg in the Barents Sea, which is likely to come on line in 2022 also, but by then overall decline is likely to have taken over again from the Johan Sverdrup bump. 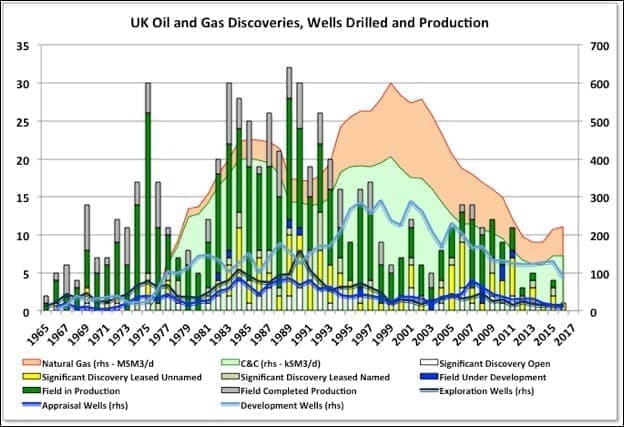 The UK production for both oil and gas follow fairly good bell curves about ten years behind the equivalent exploration drilling and discovery curves. There’s been a small uptick recently which is likely to continue rising into 2018. The new production is mostly coming from older discoveries that were approved for development in the high price years, rather than an opening of a new exploration frontier. There’s a rising proportion of heavy oil in the new production (and the outstanding discoveries not yet being developed). 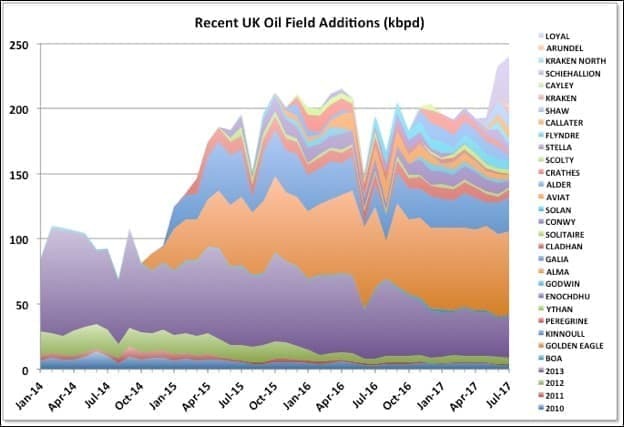 Month-to-month UK oil production has been gently falling recently after a local peak last year, but after this year’s maintenance period it’s likely to start increasing through 2018 as new developments are brought on line and ramped up. The overall rate of increase and final peak (a local peak, still well below the 1999 maximum) depend on how fast the decline in some of the existing, larger producers, especially Buzzard and Golden Eagle, sets in. That in turn depends a lot on water break through. Buzzard is showing clear signs of decline as the water cut increases above 50 percent. Nexen, the operators of Buzzard, have announced an FID for a phase II of Buzzard development, a four well tie back, is likely next year with first production in late 2020. That could indicate they expect rapid decline to set in now, but also that there are still some reasonable oil reserves left (Buzzard has so far done much better than originally expected). Golden Eagle and Balloch also have rapid water breakthrough this year. I haven’t shown all the other fields. The older water flood fields, Alba, Forties, Captain and Statfjord, have water cuts above 90 percent and it’s just a question of when they become uneconomic and get shut down, though Captain has some EOR planned to extend its life (I think polymer flood). Statfjord field straddles the UK/Norway border so some production is booked to the UK (Flyndre and Utgard, two recent developments, are similar). Clair field production will increase significantly when the Clair Ridge project ramps up next year. Jasmine and Franklin are really gas-condensate fields, although their production is reported as oil and associated gas, and have sustainably low water cuts. 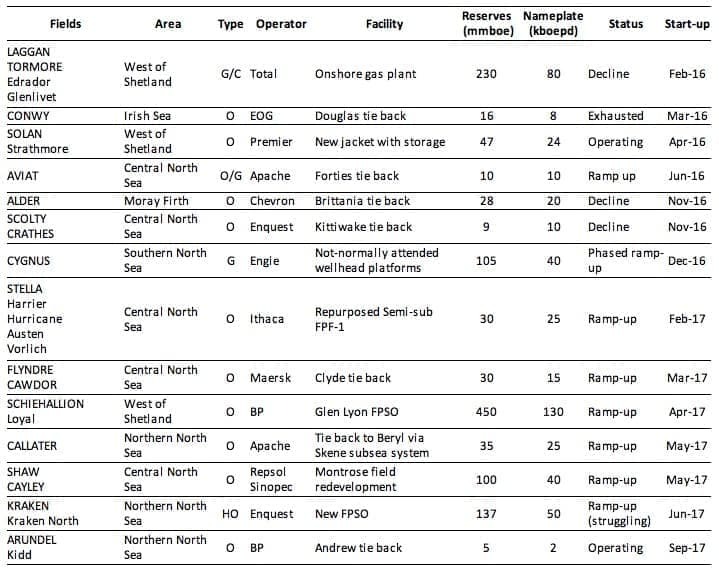 2010 to 2013 was a fairly slow period for new oil before Golden Eagle and Kinnoull. The projects that were brought on are fairly short-lived (overall, they show about 26 percent decline rate since 2014, with no sign of amelioration). There were a series of small projects in 2014 and 2015, and some of the more recent additions have proved really short lived and have died after less than two years, I don’t know it f there are plans in place to get them going again, but now the larger projects approved in the high price years are coming on line. Cayley and Shaw are part of the Montrose Area redevelopment and started up in May. They are currently at about 12 kbpd combined, but the project has nameplate of 40 kbpd so should see ramp up over the next year. Kraken is heavy oil and having a difficult start-up. The big jump, which will continue, is from the Glen Lyon FPSO, which is a redevelopment of the Schiehallion area and includes the Loyal field. See below for more details on these fields and ones due shortly. For the UK the North Sea has produced more equivalent barrels of gas and condensate than oil, and still does. Gas production is highly seasonal but generally now showing a decline, in particular from the older dry gas fields. This is probably going to accelerate now, but may be ameliorated for a couple of years by the associated gas from the new oil fields and the Culzean project currently in development. The Laggan-Tormore Project is the largest recent addition for local gas supplies. It was advertised as supplying 5 percent of the UK needs, which it did – for nine months and is now in decline. 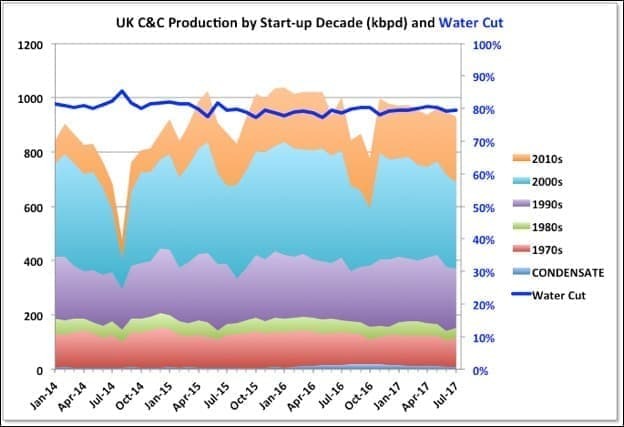 I’m not sure if there are other wells due there that will boost supply again, if not it looks like the reserves might be less than expected (the development was well over budget, so they would have been hoping for something better). Cygnus, discovered in 1988, is another relatively large field. It too was advertised as supplying 5 percent of UK gas needs, but it is being developed in phases and has not hit that mark yet. The only major gas development in the works is for Culzean, due in 2019. There is likely to be continued decline in the medium to longer term. With Ormen Lange, which exclusively supplies the UK from Norway, also in decline let’s hope there’s enough LNG for sale, otherwise the UK is going to be looking for any fuel it can find and never mind the consequences. 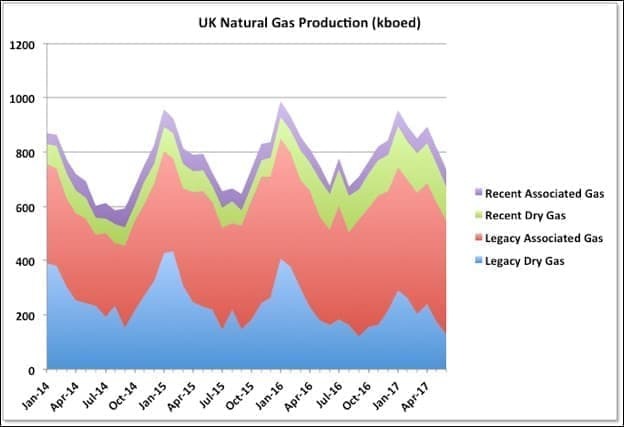 In July the big seasonal storage field at Rough was closed, so LNG will also become more important as a long-term emergency back-up fuel in the future. Other projects in development are Clair Ridge, to be installed this year and likely to be a big producer but on a part of an already producing reservoir (hence not in the table); Mariner, which is a heavy oil project for Statoil; and Culzean. Culzean was initiated by Maersk but presumably will now be taken over by Total. After 2019 new oil coming on line will be very sparse and rapid decline is likely to take over. 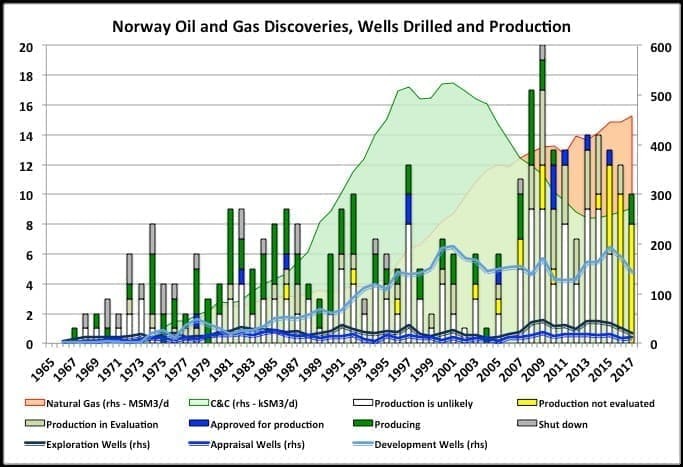 Note that the caveats for nameplate and reserve capacity given above for the Norway fields also apply here – more so for the reserves as the UK Oil and Gas Authority doesn’t supply their own estimates so the numbers are taken from trade media reports and company investor presentations. The second table shows significant discoveries that are likely to be developed. Fram is a gas field with a thin oil or condensate rim, which has been around a long time. At one time it was planned as a stand-alone FPSO development, but now, following some poor results from reservoir analyses, Shell are planning on a twenty-mile tie back to Shearwater. The production rate and eventual recovery will be lower than the original proposition. After Fram Chevron’s Rosebank might be the only largish stand-alone project left to be developed. It too has been around for a number of years without yet finding a commercial development option, although I think they are trying again at the moment, possibly with a leased, refurbished FPSO. There are some smaller undeveloped fields, often for heavy oil, that could see platforms rather than tiebacks and the result of the pilot project for the Hurricane basement rock reservoirs may lead to bigger things as well. There are a couple of fields that might be redeveloped but most undeveloped SDs (significant discoveries) will be small tiebacks and a lot might end up stranded and non-commercial. There are few to none other discoveries that might be developed other than those above. There is still some exploration drilling, but it has been fairly disappointing so far (only one significant discovery, by Statoil, and that not necessarily big enough to be commercial unless there is an available tie back opportunity). There are still a couple of high impact wells to be drilled in the West of Shetland area this year. In October there were six operating offshore rigs for the UK, the lowest in Baker-Hughes records. Are Oil Markets Immune To U.S. Shale?